Online video is breaking through, and some savvy retailers are acting fast to capitalize on the trend. 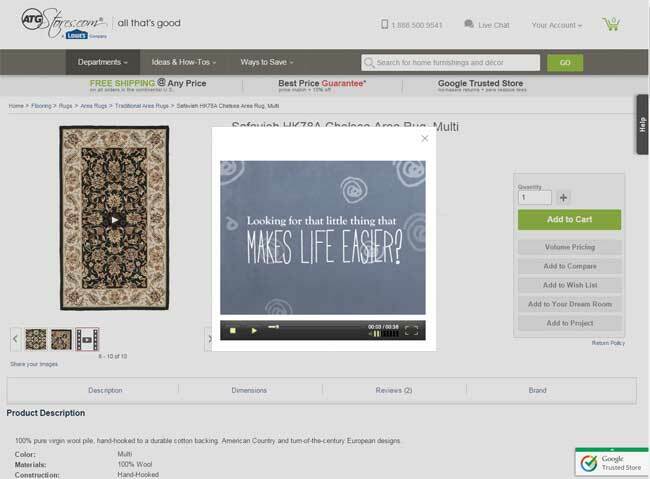 Video marketing solution Treepodia announced today that its slution was used by ATGStores.com (a subsidiary of Lowes) to create 219,000 product videos in just 24 hours. The result, according to Treepodia was a 14 uplift in conversion, representing a 5.5x ROI based on the increase in sales. ATGStores.com had previously created its own “how-to-videos” to help customers with projects but wanted to create product videos on a large scale. Treepodia used ATGStores existing set of product data to create the videos, and developed a dynamic video sitemap to ensure the videos were indexed by Google and distributed on YouTube. “Showing multiple product images is great but it’s not the same as videos which give customers a full sense of the product with its features and benefits,”said Nick Hupka, Director of Marketing at ATGStores.com.